I have download your library modified Manchester, but I cannot seem to make it work . I have 1 Attiny45 8Mhz ( internal OSC. ) 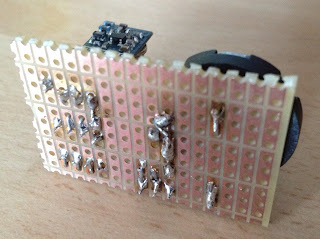 for the TX with RF 315Mhz ( http://www.seeedstudio.com/depot/315mhz-rf-link-kit-p-76.html?cPath=139_140 ) and Arduino Uno for RX . There are a number of reasons why this might not work for you. 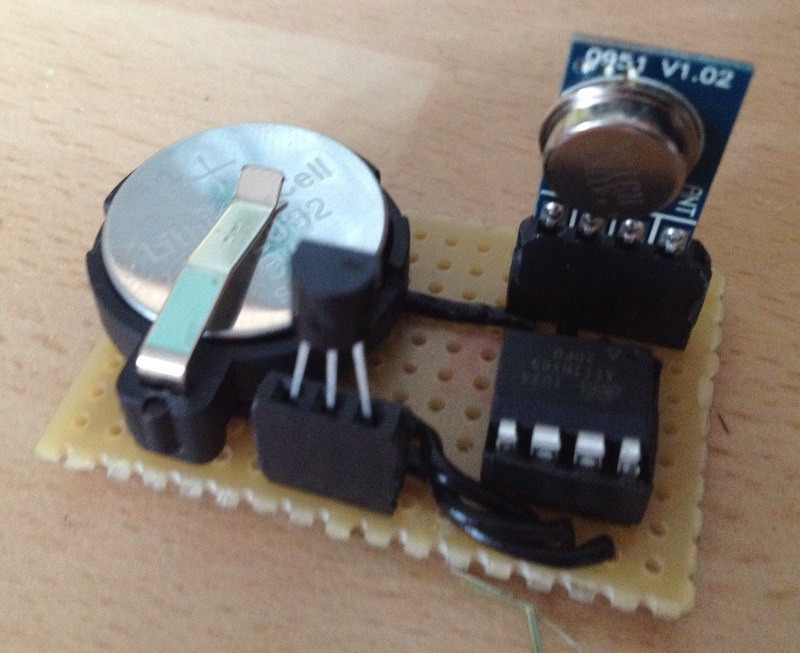 Are you sure the ATtiny45 is actually configured to run at 8MHz? Have you tried sending a simple on/off signal without the Manchester library e.g. on for 1 second, off for 1 second. Your RX node could then poll the received value more frequently (e.g. 10 times a second) to validate that you receive the expected on/off value at the expected rate. What kind of aerial are you using? Thought you might be interested in my version, which is basically a remake of yours. Had been meaning to do something similar for a while but seeing yours spurred me into action. I put the code on github at https://github.com/fasaxc/WirelessSensorNode. I thought about just using your code but part of the fun for me was writing it myself so I ended up starting over. Haven't done much on the logging end yet, I'm just using an Arduino to decode the manchester encoding and spit it out to the serial port. I have a little server box that's just logging the output to disk for now. I really like your laser cut box - its very nice looking. 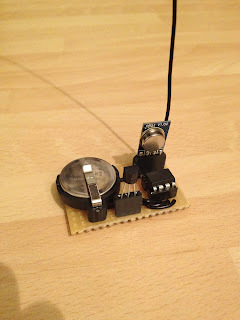 I might try making something like that for one of my future wireless sensors. I've not done much with my wireless sensors in a while as I'm waiting for my Raspberry Pi (due in the next few days) to be my always on home server for uploading readings to the Internet (probably to Pachube). Thank you for the information you are sharing, it helps me a lot for my project. If I set ATtiny85 to run at 1MHz (To save battery), what do I need to change on my arduino in order to sync with the transmission? i've spend numerous ammount of time, trying to make this library work with my hw. For receiver i use arduino UNO - i'm never getting any interrupts and i never reach body of MANRX_ReceiveComplete(). Unfortunatelly tutorials, that are listed with code are not obvious. Can you make explanation - what do we put to setup and loop() ? recordReceivedData() is the method which handles the message reception. Note that I had to call delay(1) before the MANRX_ReceiveComplete() line for reasins which I never understood. You must call GetMessage *before* calling BeginReceive again. This looks fine to me. Does it work for you? If not you may have a hardware problem which I can't easily help you with. attiny85-PU (8MHZ internal + BOD disabled). 1) I will try to re-upload code to attiny using your hardware.txt profiles. 2) And i will check what is transmitted for 11111111, and if it is recieved correct with digitalRead(). Maybe there is issue with current type of transmitters. (2) This sounds like the right approach. You are ultimately going to have to read and understand the Manchester code to understand how it should work. (3) Your TX/RF look fine. Ok, still no signal, but i'm getting some progress. I've put output of received signal and find out that i need pulldown resistors for both TX and RX. I've tried clean arduino with your sketch, but didn't help. 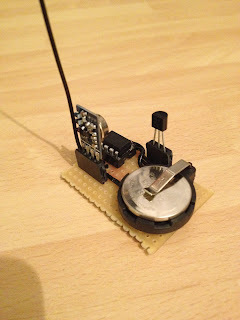 Hi, I have some doubts about the physical connection of the RF module and the TMP36. The following pinout is right? first of all I think that your project is cool. To me it looks both cute and polished and it used as few parts as seems reasonable. I have some questions because I'd like to build something similar in order to control our heating at home. 1. What is the distance of the radio signal (in a house), i.e., can it pass, say, three walls and make it to a receiver that is 20 meters (60 feet) away? 2. Can you distinguish more than one sender, i.e., does your thermometer have a unique ID that is transmitted together with the temperature? 4. 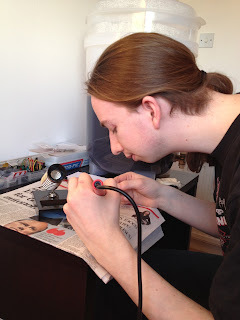 Would a change to, say, two AA batteries make the circuit more complex? As you can see from my questions, I'm quite new to the biz :) but I hope you dont mind answering. 1) You should be able to get it through a couple of walls. 2) Yes I send a unique ID as part of my data from a wireless node. 3) I have got battery life calculations in another blog post. 4) Changing the battery type shouldn't make too much difference but you will need to make sure the voltage is in an acceptable range. Please give me some hint, what is wrong here. Thanks a lot. I fixed this, but now I always receive 0s. I have the same problem when compiling. How did you fix it? I have the same problem too? any news? Hi, I have a question: is possible change the temperature sensor by a relay and connect this one to a light switch? What do you mean by "change the temperature sensor"? Thanks for the information. I found this when I was trying to investigate variations in the internal voltages of the ATTiny range. I realise you did this a while ago, but I've written a calibration code for ATTiny, which might be useful to you or others. Thanks - that looks really interesting! I am pretty sure its because I am missing a Core file or two somewhere. But I have downloaded lots of core stuff too and it still doesnt work. Can anyone advise on a procedure for library and core files that they used which worked? Hi! 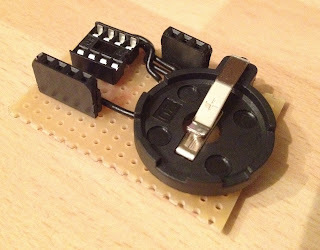 is there any way to get the schematics for this project? 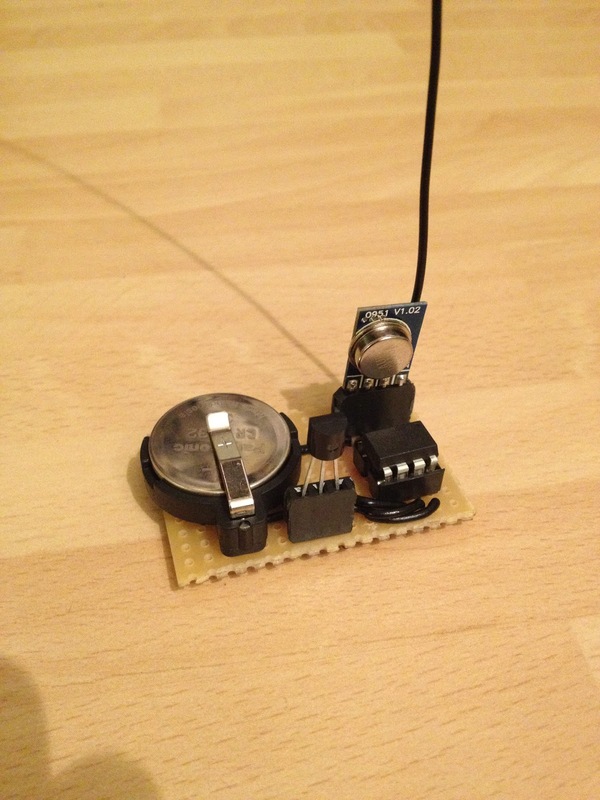 I am trying to contact you in regards to a wireless sensor node project. Do you have an email I can contact you on?